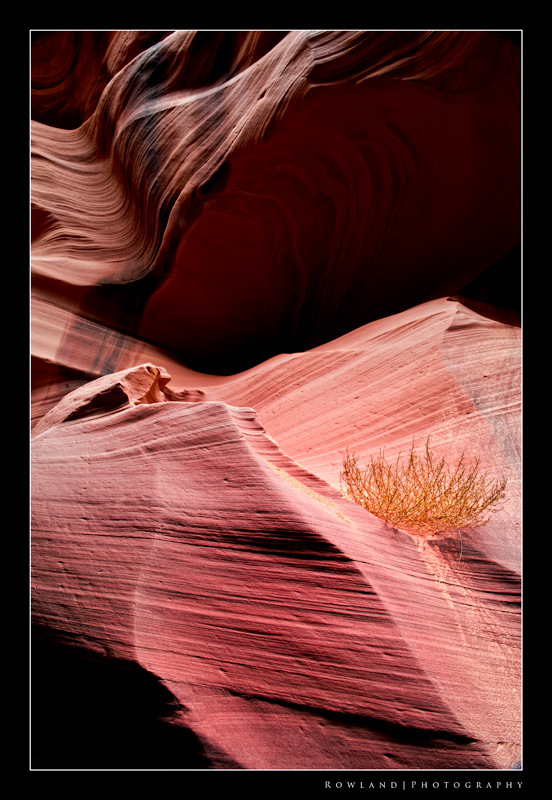 Took a break from Yosemite last night and headed back to Page, Arizona to one of my favorite places… Antelope Canyon. Been awhile since I viewed the images, and as always, with a fresh set of eyes you find an image that makes you suddenly go “Hmmmmm.” Five bracket HDR, finished in CS3 with NIk’s Color Efex Pro to bring out the color in the rock and also adjust some of the photos contrast. 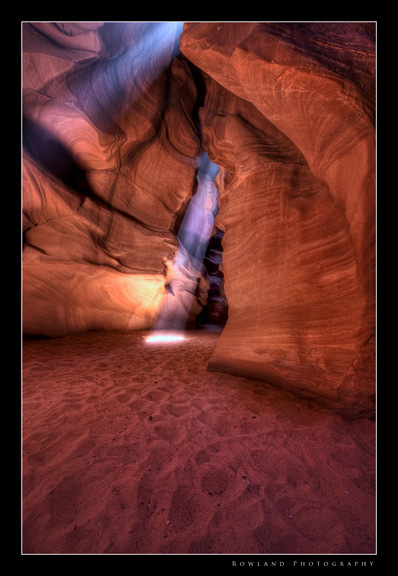 This is toward the end of Lower Antelope Canyon. Another shot I took down in this area ended up being printed on Aluminun and selling at The Gallery. If you are reading this and have never been to Antelope… would HIGHLY recommend you update your bucket list and plan a trip. It’s that amazing. 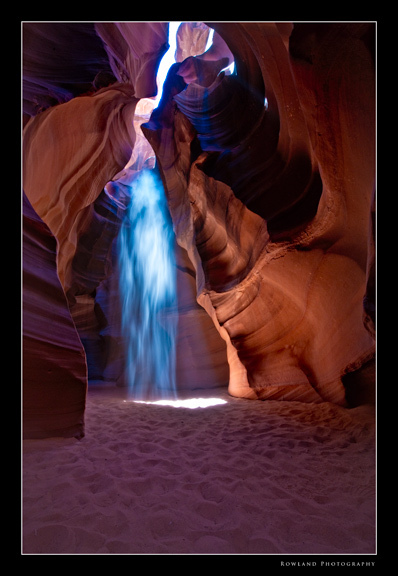 Antelope Canyon is one of those places that just stays with you. You can’t help but think about our connection with “Nature” walking through those canyons. The geological process and eons of time spent carving the rock, the sunbeams shining down and progressing from bright shafts of light to nothing more than wisps driven by our earth’s revolution in space around our life-giving sun. You can’t help but think Big Thoughts about the BIG THINGS when you are there. It’s humbling, and beautiful, and amazing all in one. I am always amazed where life finds a way to make itself present. A flower in the middle of a cement parking lot, a single tree growing on a highway divider… in this case a tumbleweed plant growing in the crevices of Antelope Canyon. Right there on a ledge… not sure where it draws water or nutrition from… but it’s found a way to get by. 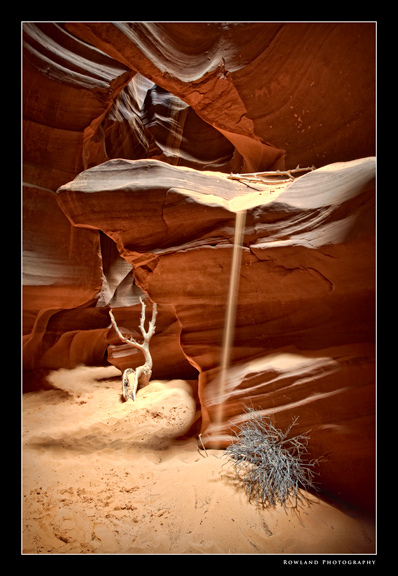 Peter Lik whose work truly admire has a famous photo taken in Antelope Canyon, its entitled “Ghost” and its an image of a light beam with floating sand particles that vaguely outline a ghost figure floating between the red rocks of Antelope. As I was shooting, I kept thinking of that image and hoped a similar situation might present itself to me. Those light beams become visible as someone throws sand around. The suspended particles outline and sharply define where light is falling… they tend to give the beam its shape. The downside tot his is your expensive camera equipment gets inundated with sand and small particles which seem to forever stick to everything, no matter how much you clean it. But that’s, I guess, a “photo opp” hazard we photographers are more than happy to deal with when the place you are shooting is as awesomely magnificent as Antelope. I didn’t really see this image nul I went into Post. As I was finishing some of the shots from Upper Antelope, I sorta sat back and noticed the outline of a figure “walking” through the canyon. Reminded me of a friendly spirit revealing itself to my lens. I think of all the images this and “Fire & Light” which I posted a few days ago are my favorites. I visited Antelope Canyon in January of this year and had the place to myself… literally, maybe 5 people walked through the place while I was there. Obviously the chill, and the lack of “sunbeams” shining through the rock formations dampens a typical tourists enthusiasm but I still found the place magical. It might very well be my favorite place to shoot. The color, texture, and beauty of the rock is simply mind shattering. It’s “unbelievable” and a must see if you are into geology that unfolds over epochs of time. Yesterday I went back. 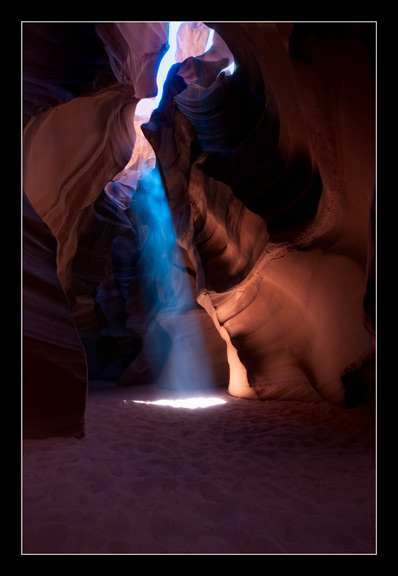 Along with hundreds of others and true to form, the “Shafts of Light” and sunbeams didn’t disappoint. In fact, they were mesmerizing to see and watch move across the rock and sand and disappear as the sun marched on due to our planetary spin. However, the joy was short-lived as hoards of folks walked through my compositions, lifted their cameras into my view, or simply stood in my way. It was a very different experience from the Winter session just a few short months ago . While I think this place should be seen by all, I do believe there will come a time when crowd control becomes important to preserve the “magic” of the very place everyone is there to see. Antelope has become a victim of its own popularity and success…which as a photographer I find a blessing and a sad curse. I think the world should see this magnificent place, yet I also feel that it should remain special, and not become pedestrian or abused. Tough call, no right answer I know. As a matter of fact, as a businessman, I am glad this natural formation employs all the tour operators and allows the guides to share this unique wonder and their knowledge of the area with all of us. Again, my guide Vernon was a wealth of information about the place and the Navajo Indians (who own the land the slot canyons are on) and remains an all around great guy. Enjoy today’s image, its one of my favorites I’ve shot in a while. 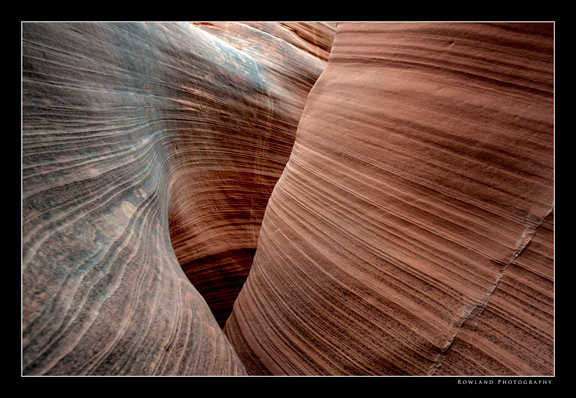 Continuing to finish images taken while visiting Antelope Canyon. 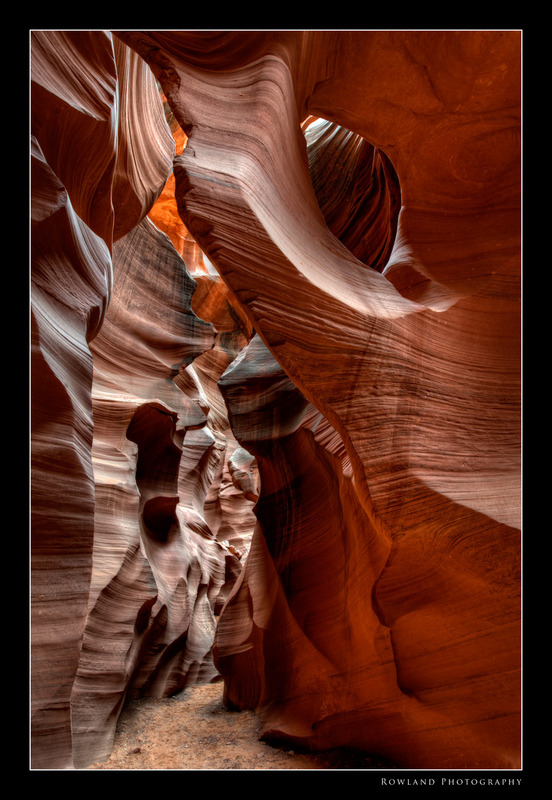 Here the walls narrow, and tilt toward the slot opening at the top where light floods downward illuminating the canyon. I’ve said it before, and I’ll probably say it again (and again!).. This is truly an amazing place. 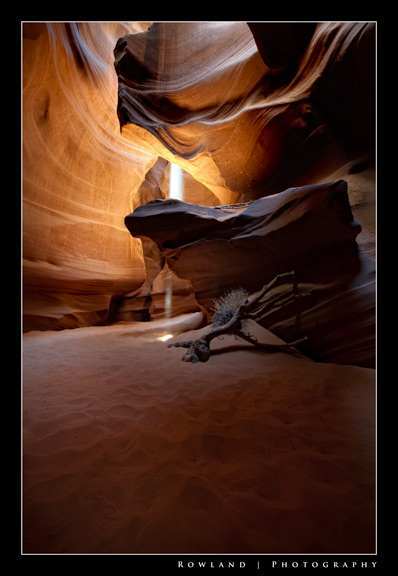 If you ever wonder what some water and the passage of time can do… go visit the slot canyons of Arizona. You’ll be amazed at the answer. 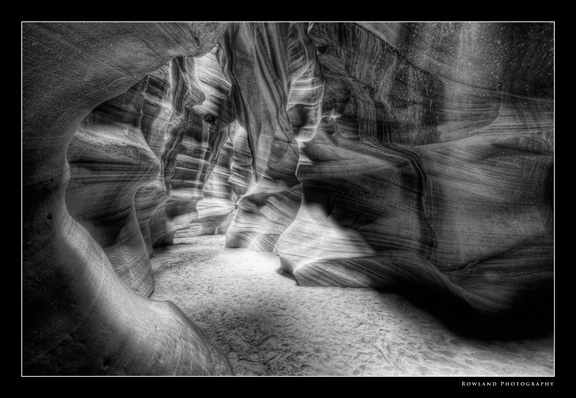 This shot is taken in Rattlesnake Canyon, just down a piece from Upper Antelope Canyon. The water had literally carved a “wave” in the rock, from top to bottom. 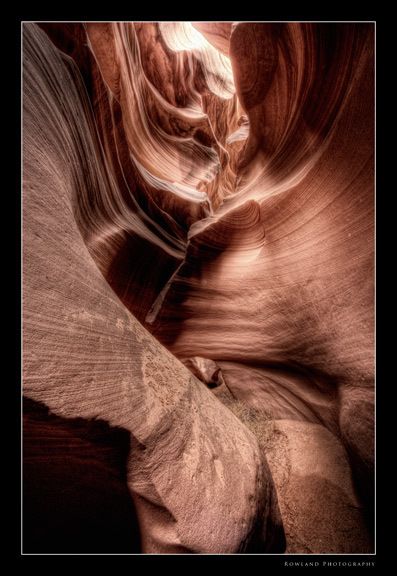 The amazing-ness of Antelope Canyon still remains fresh even though its been a few weeks since visiting. I love going through the images and finishing them and diving back into the memories of walking the sandy floor and carefully sliding through the canyon walls. There is a peace inherent in this image that I find really appealing… Enjoy!